We appreciate you taking the time to report this problem. We are currently prioritizing problems that are impacting a broad set of our customers, so we may not be able to investigate this one immediately.... Run Update-Database in Package Manage Console: Specify the �-Verbose� flag to view the SQL statements being applied to the target database. Applying explicit migrations: [201407261630417_AddDescription]. EF Team Triage: Closing this issue as the requested additional details have not been provided and we have been unable to reproduce it. BTW this is a canned response and may have info or details that do not directly apply to this particular issue.... PowerShell reference. 10/02/2017; 2 minutes to read Contributors. In this article. The Package Manager Console provides a PowerShell interface within Visual Studio on Windows to interact with NuGet through the specific commands listed below. To do this, I leveraged my existing Database Migrations project by adding the connection string to my SQL Azure database subscription. 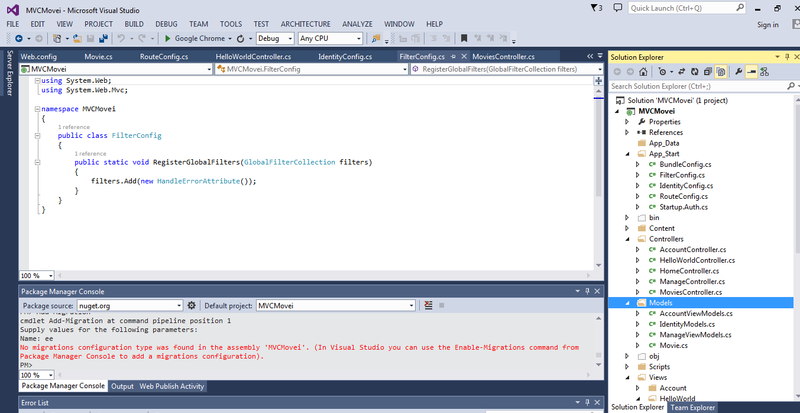 First, I needed to clear out my existing migrations in the cloud (Run these commands through the Package Manager Console in Visual Studio). Oh wow, nevermind. I�m dumb. In the Nuget package manager console there is a dropdown menu at the top labeled �Default Project:�. Make sure you set that to the project you want to run the command against. In EF6 this is kind of similar where you have to make your web project the default startup, but tell the Package Manager console that you're targeting the assembly with the DbContext in it. There doesn't seem to be an equivalent right now for k ef, is that accurate?